Beginning in 2012, Chevrolet provided funding to purchase and retire carbon reductions sourced from clean energy efficiency projects on college and school campuses across the U.S – in collaboration with USGBC, the Association for the Advancement of Sustainability in Higher Education (AASHE), and other stakeholders across the country. This Campus Clean Energy Campaign is now being carried forward by Second Nature so that campuses – both those already qualified and new campuses — can take advantage of this unique new source of carbon credit financial capital that can accelerate their progress towards a clean energy future! Chevrolet launched the Campus Clean Energy Campaign in order to help invest in and promote a clean energy future worth driving towards, not only in its vehicles but in our communities. Indeed, if innovative cars, such as the Chevrolet Volt and new Spark EV, are to realize their full potential, they will be charged by an efficient, cleaner energy infrastructure in our communities. Three non-profits, the U.S. Green Building Council, AASHE and Second Nature all partnered to support Chevrolet’s innovative investments in clean energy efficient projects on US college campuses. The funding opportunity is open to all U.S. universities, colleges and K-12 schools. A campus determines whether its performance in reducing carbon emissions through their clean energy efficiency leadership will qualify based on new carbon methodologies that Chevrolet developed with the Climate Neutral Business Network and were approved through the Verified Carbon Standard. If eligible, campuses were able to receive funding by selling and transferring its carbon credits to Chevrolet for the purpose of retiring them to benefit the climate. Going forward, Second Nature is acting as campuses’ seller agent to help engage other carbon credit purchasers and thus help campuses continue to access such funding from the US voluntary carbon market. Campuses carbon reductions can therefore be evaluated on a campus-wide basis (in stationary 1 and/or scope 2 electricity based emissions) or determined for individual LEED certified buildings. Projects can readily determine their eligibility for LEED certified buildings reductions based on energy/CO2 emission profiles that have already been derived from their LEED building certification documents. The carbon emission profiles are then determined through entering the LEED certified energy data into the EPA Target Finder tool. The value of carbon funding can significantly contribute to campus’ efforts to further accelerate clean energy efficiency leadership, as reflected in several demonstration projects which provide examples for how LEED buildings can be evaluated and why the funding from carbon credit purchasers like Chevrolet can be valuable. There are simple steps involved establishing whether a project would be eligible for carbon credit funding – and in seeking to sell credits to secure such revenues — with tools and resources which Chevy originally developed still available to support and streamline this process and answer frequently asked questions. Chevrolet was particularly interested to support and recognize the ingenuity of the next generation of clean energy efficient entrepreneurs – the students themselves – through an innovative on-line dialogue #CleanEnergyU which was repeatedly top trending on twitter in 2015, engaging student and clean energy leaders in creative conversations towards a clean energy future. Such millennial leadership, in concert with the suite of clean energy projects Chevrolet supported across the country, will not only help power the next generation of cleaner electric vehicles such as the Chevrolet Volt and Spark EV: it will help us all to find new roads to create a future worth driving towards. In order to surpass the performance benchmark for eligibility, the building must qualify within the top 50% of LEED buildings’ EUI improvements over regulatory code design performance, likely placing them beyond the LEED average Energy Star 86 performance achievements. The top 50% of LEED certified buildings typically achieve a 21-26% EUI (BTU/sq ft) improvements vs. code-based EUI, based on USGBC’s historical analysis by sector. 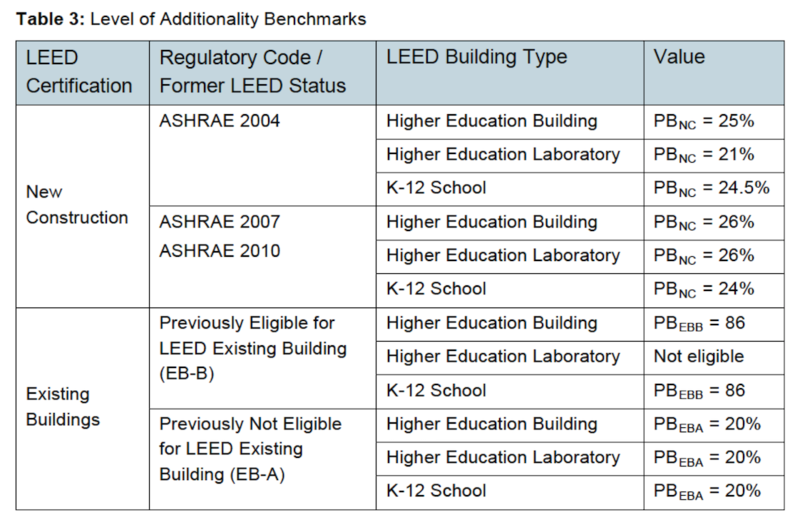 EB-A: Consistent with LEED credit 67, in order to surpass the performance benchmark, the eligible building will have achieved a 20% reduction in EUI (BTU/sq ft) in a single year, while starting historically from a baseline performance level that would not render the building eligible for LEED certification. EB-B: In order to surpass the performance benchmark, the eligible building will have met at least the LEED building average Energy Star performance rating (currently ES 86) in practice as monitored through EPA’s Portfolio Manager (Excluding US higher education campus laboratories). Using their LEED performance data, campuses can readily estimate the total CO2 reductions that might qualify for carbon credit funding using the Excel Template. Chevrolet was open to consider funding purchases over several years, spanning mid-2011 through December 2014 and paid a premium in terms of $/ton over the prevailing voluntary carbon market pricing. Going forward, inquiries from campuses can be made to Second Nature to explore future funding prospects. Interested campuses can contact Brett Pasinella to learn more about funding opportunities and eligibility criteria. What’s the incentive for campuses? Carbon funding can contribute 5-25% of the incremental capital needed to deliver clean energy efficiency performances at this level of leadership. The monies are designed to reward top performing campuses and to help expand their clean energy efficiency and climate performance on campus. The business case is therefore compelling to spur campus clean energy leadership. Interested campuses can contact Brett Pasinella to learn more. Chevrolet has already funded eleven campus clean energy projects, two of which from Southern Oregon University and the University of Illinois at Chicago were LEED projects, which have used the new VCS methodology to secure Chevrolet’s funding to support their GHG leadership. Other campuses like Ball State also explored how to use the new methodology, providing demonstration examples for how a campus can evaluate its eligibility to secure Chevrolet’s funding and the value of the resulting reductions in order to further support their campus GHG leadership. Ball State University built its LETTERMAN building in 2007, earning a Silver LEED certification. When considered (albeit on a non-qualifying basis due to its age) as an NC building under the new methodology, LETTERMAN would not have met the performance benchmark since its percent improvement in EUI over code was 19% when 25% would be the required threshold. However, like many leading green building pioneers, Ball State has continued to invest in clean energy efficiency on a system-wide basis. In particular, in 2012, it began running a campus-wide geothermal system to replace its coal boilers. Interestingly, this generated an improvement in EUI in the LETTERMAN building of more than 20%, opening up the option for it to qualify for Chevrolet funding under the LEED EB-A route, earning potential credits of over 400 tons CO2 per year. However, the geothermal systems were so dramatic in their impact that they enabled Ball State to qualify for campus-wide funding (for stationary 1 reductions that exceed an average of 5.86% per year) which offered the potential to earn many more tons of CO2 credits per year – a route that Ball State chose to pursue with Chevrolet. The business case for its LETTERMAN LEED building was nonetheless intriguing; based on the $3/square foot that LEED estimates is needed to deliver outstanding LEED performance levels, a 10 year stream of the LETTERMAN building credits (at $5-10/ton) would provide a 7.5%-15% return on incremental capital. The LETTERMAN building’s pro forma excel templates can be reviewed alongside the EPA Target Finder summaries that resulted, here. 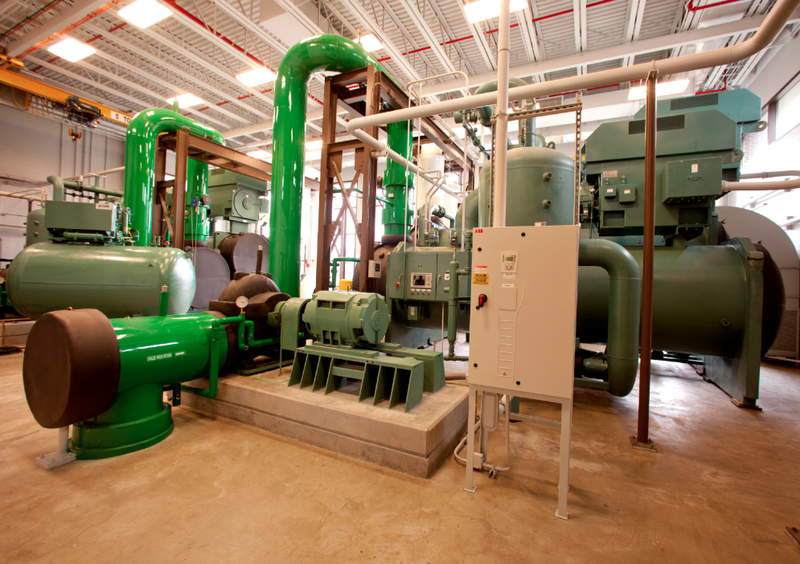 Ball State University has implemented the largest geothermal energy system of its type in the United States. A campus building that recently earned LEED Gold certification undertook a similar review of its eligibility under the LEED NC module. With a 37% improvement in EUI over code, it readily surpassed the 25% performance benchmark threshold requirement. Reflecting the building’s small size, the 7 tons of CO2 per year that would be generated in credits nonetheless generated a 1.5-3% return on incremental capital, comparable to the value of utility incentives on the region, based on the $3/square foot that LEED estimates is needed to deliver outstanding LEED performance levels and a 10 year stream of carbon credits. A campus laboratory similarly discovered that its design could enable it to be eligible for Chevrolet funding by achieving more than a 20% improvement in EUI within a single year, under the EB-A route. With design specs for the building indicating a 25% improvement was likely, this translated into credits of 990 CO2 tons per year. Again taken over a 10 year period at $5-10/ton CO2, this offered a potential 15-30% return on incremental capital – a significant motivation to ensure that the laboratory would indeed deliver on its fullest potential in practice. These buildings’ pro forma excel templates can be reviewed alongside the EPA Target Finder summaries that resulted, here. What are the key steps involved in putting a project forward for carbon credit funding? Complete initial due diligence (drawing upon information in your LEED building’s certification documents) to evaluate project eligibility and performance parameters, inputting further data to the excel templates sheets. 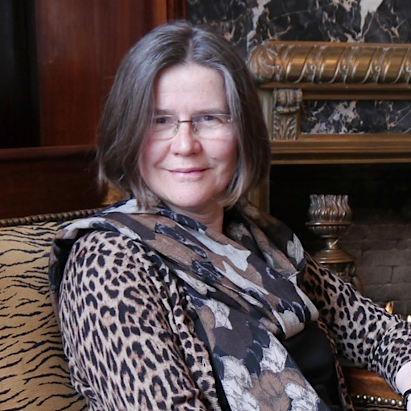 Evaluate attractiveness of project funding investment from campus’ point of view. Typically, carbon purchasers enter into contracts directly with a campus in order to transact for the carbon reduction tons it wishes to provide: transactions can be coordinated and supported through Second Nature. Fully complete project certification materials (the excel template, the project development document and the monitoring report) which are ultimately submitted to carbon credit validators/verifiers for VCS certification. Participate in a third-party project validation review of the project’s carbon credentials and verification of its credits in order to get them issued. In order to achieve VCS certification all carbon projects are reviewed by a designated third-party VCS reviewer. Second Nature can also supply further information regarding the VCS project certification process and steps required to get projects VCS approved and credits verified. Having secured VCS credit issuance, transfer carbon credits to purchaser (which can be facilitated through Second Nature’s registry account) and receive payment. whether a campus would qualify based on its GHG performance. the size and value of resulting CO2 reductions. a summary of the project for VCS’s certifiers to review for validation purposes (conducted once up-front). details of the project’s credentials for VCS’s accredited certifiers to evaluate in order to secure project validation. a summary of the project for VCS’s certifiers to review for credit verification purposes, conducted regularly throughout the project lifetime as credit issuance from VCS is sought. details of the project’s credentials for VCS’s accredited certifiers to evaluate in order to secure credit issuance. The VCS methodology, which outlines all the detailed project requirements, which are themselves reflected (for convenience) in the Excel Template and PDD Project Summary documents. Frequently asked questions concerning the use of the templates for LEED certified buildings are included for reference. Questions typically asked by campuses evaluating potential projects and putting them forward for funding. Questions regarding the Credible Foundations for this Approach. Chevrolet was also delighted to support student leaders who asked to convene a virtual twitter dialogue dialogue with clean energy leaders to help us all move towards a clean energy future and empower their own ingenuity and innovation. The first #CleanEnergyU dialogue took place in November 2014 as campuses announced their Chevy project funding; expanding in 2015 for Earth Month and Campus Sustainability Month, #CleanEnergyU has to date engaged hundreds of students and clean energy leaders in collaborative dialogues, both on campus and virtually on line at #CleanEnergyU – to advance our joint efforts to bring forward innovative solutions to clean energy efficiency challenges in our own lifestyles, campuses, businesses and communities. Top trending during Earth Day 2015 and for five days during the fall, #CleanEnergyU is an exciting, new opportunity designed to help campuses engage their students and faculty in cutting-edge clean energy dialogues to help promote a clean energy future. #CleanEnergyU brings together clean energy leaders with students and faculty across the US to empower them to drive more effectively towards a clean energy future. As a virtual dialogue, spanning live tweetathons and on-campus post-it board and classroom dialogues, #CleanEnergyU brings a wealth of activities to support campuses during Campus Sustainability Month in the fall and Earth Month in the springtime. How could campuses best lead their communities towards a clean energy future? How could you most effectively lead such change? What changemaker roles/qualities might you bring? Students were invited to exchange ideas on campus through post-it boards and classroom dialogues– and the share their insights with #CleanEnergyU by posting selfie photos of their ideas and questions. Suggestions for how to include these activities as part of students’ Campus Sustainability Month roster were shared in the #CleanEnergyU facilitation event guide. Clean energy leaders spanning Joel Makower (GreenBiz) to David Tulauskas (GM) and Mark Kenber (CEO Climate Group) joined dozens of other speakers for #CleanEnergyU’s third live tweetathon on October 20/21 — to engage directly with students in conversation on #CleanEnergyU. This fast paced, creative virtual dialogue included opportunities for aspiring clean energy entrepreneurs (with leaders from PLAN and stuffstr.com), leaders from Google, Microsoft, contributions from the Mayor of Portland and dozens of non-profit leaders, from the Green Sports Alliance to USGBC and campus networks. Speakers explored topics focused on both campus clean energy transformations in community and how to foster our leadership talents effectively to drive this change. Anchored upon our fall core dialogue questions, GreenBiz.com also selected the most thoughtful student articles for publication on GreenBiz.com drawing upon students insights from the #CleanEnergyU dialogues and their hand-on leadership experience on campus and in their communities. At the same time, #CleanEnergyU convened an in-person workshop during Climate Week 2015, which brought talented millennials together to meet some of the most brilliant clean energy leaders —to co-design the most effective ways to bring clean energy solutions successfully to our communities! As the only student-focused event during Climate Week 2015, this highly interactive poster-style #CleanEnergyU Kick Off event invited speakers, workshop participants and Climate Week attendees to design and prioritize the most creative solutions each believes will bring their communities and campuses towards a clean energy future. The workshop panel discussion, which included half a dozen student leaders alongside Andrew Winston, Mark Kenber, Anastasia Schemkes and other clean energy leaders, was livestreamed and reviewed on campuses across the US. Overall, #CleanEnergyU has now engaged dozens of campuses and clean energy leaders to become top trending on Earth Day 2015 and again this fall! So explore how your campus students and faculty might best take advantage of this exciting dialogue as it continues to convene conversations to empower us towards a cleaner energy future!